Win a bottle of Chaillot Brut Champagne! Win A Bottle Of Chaillot Brut Champagne For Christmas! 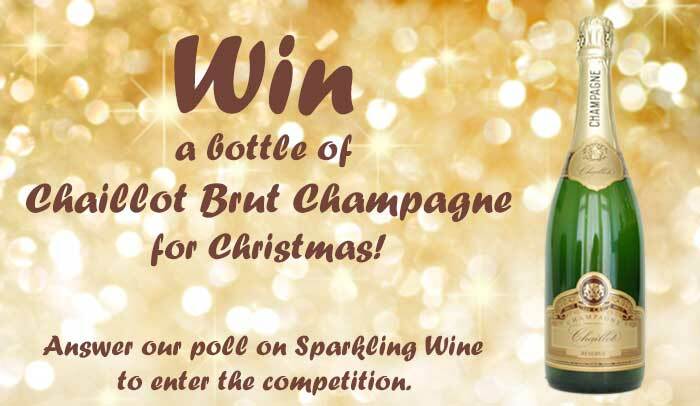 Answer our poll on Sparkling Wine below and get a chance to win a bottle of Chaillot Brut Champagne for Christmas! Answer our poll on Sparkling Wines below before Wednesday the 11th of December at midnight. Fill in your name and email address so that we know who you are and can contact you in case you win. Like our Facebook Page and follow us on Twitter and Google+ to get extra chances to win! The winner will be drawn at random amongst the entrants. We will contact you to obtain your shipping address as well as proof of age and you will receive a bottle of Chaillot Brut Champagne by post! A nice Christmas present, isn't it? We will publish the results of the poll after the end of the contest so that you know which sparkling wine is most popular this year! The contest is open to people who have answered our poll on Sparkling Wines. One winner will be drawn at random from all the entrants. The winner will receive a bottle of Chaillot Brut Champagne worth £24.99. The promotion will run from the 27th of November 2013 until the 11th of December at 11:59pm. We reserve the right to choose another winner should the winner not have a UK mainland shipping address, be over 18 or have answered the poll. The information shared with us will only be used to contact you and send you our newsletter. It will never be shared with third parties nor used for anything else. You can unsubscribe from our newsletter at any time. The winner will be required to provide a UK mainland shipping address. The prize will be sent for free to a UK mainland shipping address only and shall arrive within 3 weeks. Entrants must be UK residents and aged 18 years and over. Answer The Contest To Win! ¹This information will be used to contact you in case you win our contest. By giving us your email address, you accept to receive our newsletter. We will never use this information for any other purpose and we won't share it with any third party.